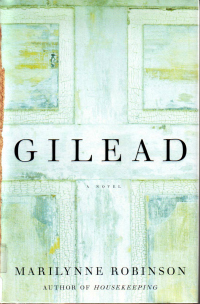 I wasn't thrilled by Gilead, or even greatly entertained - but I was moved by it, in a way. It's a thoughtful and thought-provoking novel, full of gentle humor and graceful characterization. It made me miss my friend Bill, written as it is from the perspective of an elderly man reflecting on the life lessons he's accumulated over his many years. Bill is as wise as Gilead's protagonist, as patient and generous of spirit. Many of the book's best lines reminded me of things I've heard him say. Even Bill's conversational tic of ending with Well, anyway... came to mind as I read; the narrator has a similar style of punctuating his thoughts with the same sort of humble, verbal shrug. Sometimes I have loved the peacefulness of an ordinary Sunday. It is like standing in a newly planted garden after a warm rain. You can feel the silent and invisible. life. All it needs from you is that you take care not to trample on it. A good sermon is one side of a passionate conversation. Sometimes the visionary aspect of any particular day comes to you in the memory of it, or it opens to you over time. Material things are so vulnerable to the humiliations of decay. It was as though there were a hoard of quiet in that room, as if any silence that ever entered that room stayed in it. It is one of the best traits of good people that they love where they pity. Compare the Christ-like qualities of the narrator with those of his grandfather. How are the narrator's efforts to be closer to God manifested in his words and his choices? The narrator is particularly preoccupied with his volumes of written sermons. At times he seems proud of them; at others, humility trumps and he considers o having them burned. Other material items from the church - as well as the church's structure itself - seem to concern him, too. What makes a thing holy, in his eyes? Mere ownership, or something more? What is the role of pride in all of this? Of ego? Explore how Gilead is a meditation on the difference between the way things look and how they really are. Discuss how the novel expresses that sometimes it is the things we've lost that actually stay closest to us. Paper topic: water as metaphor (baptism, rain, the thunderstorm that shut down the baseball game, sprinklers, etc). In what sense is Gliead itself a sermon? What could be considered its central message? Much of the book's action takes place in another time, and is only relayed through remembrance and flashback. How does this structuring affect the mood and tone? How does it limit or enhance what Robinson seems to want to convey?